영천 은해사 운부암 금동보살좌상(永川 銀海寺 雲浮庵 金銅菩薩坐像)은 신라 헌덕왕 1년(809)에 혜철국사가 창건한 은해사의 운부암에 모셔진 보살상으로 불꽃무늬·꽃무늬·극락조(極樂鳥) 등으로 장식한 화려한 관(冠)을 쓰고 있는 높이 1.02m의 아담한 작품이다. 얼굴은 눈꼬리가 약간 올라간 갸름한 형태이며, 온 몸을 휘감은 구슬장식이 무척 화려한 모습이다. 신체 표현은 굴곡 없이 수평적이어서 형식적으로 처리된 느낌이지만 안정감을 주고 있다. 이런 표현은 영덕 장육사 건칠보살좌상(보물 제993호), 대승사 금동보살좌상(보물 제991호)과 비슷한 양식으로 지방적인 특색이 엿보인다. 목에 있는 띠 주름식의 삼도(三道), 가슴 아래 띠로 묶은 매듭 표현, 양 다리에 대칭적으로 흘러내린 옷주름 등은 조선 초기 보살상의 전형적인 양식을 따르고 있는 모습이다. 이러한 점에서 고려 후기 경상북도 지역의 지방색을 계승하고 있는 조선 초기의 보살상으로 볼 수 있다. This gilt-bronze seated Bodhisattva is enshrined at Unbuam Hermitage of Eunhaesa Temple, which was founded by State Preceptor Hyecheol in 809, the first year of the reign of King Heondeok of the Silla Dynasty. 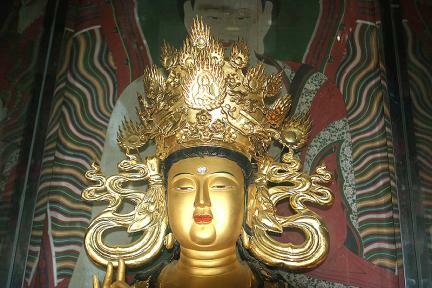 The Bodhisattva is 1.02m high, and wears a splendid crown decorated with designs such as flame patterns, flowers, and birds of paradise. The statue has an oval face with slim eyes slightly slanted upwards and has splendid bead decoration surrounding the whole body, which is expressed vertically without any curves, giving a stable impression. This kind of expression shows local characteristics similar to the style of the Dry-lacquered Seated Avalokitesvara Bodhisattva of Jangnyuksa Temple, Yeongdeok (Treasure No. 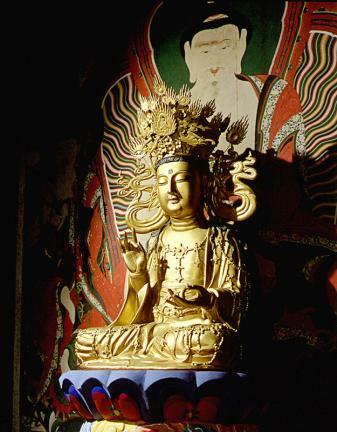 993) and the Gilt-bronze Seated Avalokitesvara Bodhisattva of Daeseungsa Temple, Mungyeong (Treasure No. 991). The samdo, i.e. the three wrinkles on the neck, the knot of the strap below the chest, and the folds in the clothes falling symmetrically around both legs exhibit a style typical of the Bodhisattva statues made during the early Joseon Dynasty. Based on these points, it can be said that this Bodhisattva statue was made during the early Joseon Dynasty but retains the local characteristics of Gyeongsangbuk-do in the late Goryeo Dynasty.